Red deer are found throughout much of Europe, including a large swathe covering north France, Germany, Austria, Czech Republic, Hungary, Slovak Republic and Poland. They are also found in Norway, southern Sweden, parts of Latvia and Estonia, and throughout Turkey into northern Iran, north through Georgia into southern Russia and west to Crimea. There are smaller populations in Spain, southwest France, west Italy and Yugoslavia. Red are the only deer species that inhabit Africa, where they are found in the Atlas Mountains in the north of the continent. This species is generally absent from Mediterranean islands, the exceptions being Corsica and Sardinia. Outside of Eurasia, this species has been introduced to parts of South America as well as New Zealand and Australia. 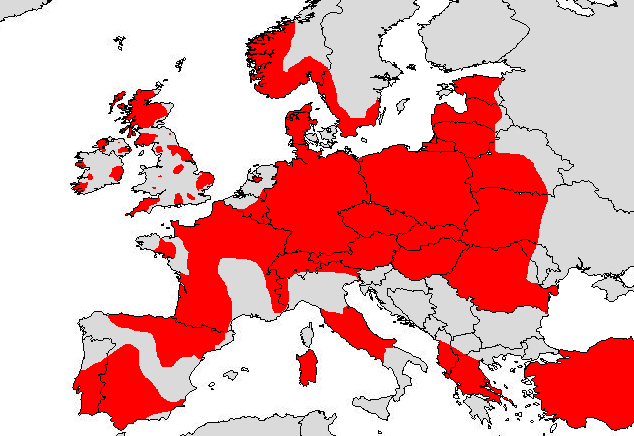 The approximate distribution of the main Red deer (Cervus elaphus) populations throughout Europe (red colouration). This map is based on multiple sources, amended as per Derek Yalden's drafts in Mammals of the British Isles: Handbook, 4th Edition (2008) and the British Deer Society's 2007 and 2017 survey maps. It does not include single sightings nor records of vagrant animals. In the UK, Red deer are most abundant in the Scottish Highlands and Outer Hebrides—where they are still considered “native stock”, generally referred to as Cervus elaphus scoticus—although their distribution includes most of Scotland, with the exception of the eastern fringes of Aberdeenshire, Kincardineshire and Angus – they appear to be absent from Fife and a belt across southern Scotland from roughly north Ayrshire to Berwickshire. Within England, there are isolated populations in the Lake District (Cumberland and Westmorland), parts of East Anglia (Cambridge, Norfolk and Suffolk), parts of Hampshire and Wiltshire (the New Forest), the Quantocks in Somerset, and Exmoor in Devon. The 2007 Deer Distribution Survey (published by The British Deer Society) suggests this species has expanded into the Midlands (Yorkshire, Derbyshire and Lincolnshire) and further into East Anglia (Essex and Middlesex) and down into Surrey, Sussex and Kent in recent years. There also appears to be expansion of the Hampshire population west into Dorset. Red deer appar to be absent from many of our islands, including the Isle of Man, Orkney Isles and the Shetland Isles. Officially, the Isle of Wight, just off the coast of Hampshire, is free of deer, except for those held in deer parks on the island (e.g. at Newclose Farm in Yarmouth and Chale near Carisbrooke Castle) and no endemic populations have been recorded there. Deer are, nonetheless, good swimmers and it would not be unexpected for some to make it onto the island from the mainland. Similarly, escapes from deer farms are well known to have led to the establishment of feral populations of deer on the mainland so this cannot be discounted either. Whatever the source, in recent years sightings of free range deer on the island have increased, leading Tim Brayford to establish the Isle of Wight Deer Conservation (IWDC) group to collate these reports. IWDC are keen on protecting the whatever deer populations there are on the island and, as such, are unwilling to provide any details of the reports they’ve received; but in their 2017 update do confirm that Red deer have been seen wild on the island. There are scattered populations in Wales, including Welshpool, Monmouthshire, and parts of the Lleyn peninsular – these probably represent escapees from Powis Castle near Welshpool and various deer farms. There are isolated populations in Ireland, including Donegal, Down, south-west Connaught Province, Limerick, Wexford and Kerry.